These carriers hold two EpiPen®, Jext®, or Anapen® adrenaline pens. Velcro closure for easy access. Padded interior with foil lining for protection. 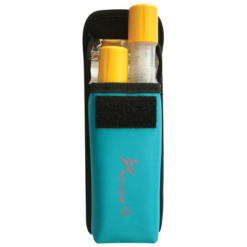 These epipen carriers are perfect for carrying 2 EpiPen®, Anapen®, or Jext® auto-injectors. Could also carry one adrenaline pen and an inhaler or one adrenaline pen and anti-histamines. These holders are padded and foil lined to protect your pens. They have a Velcro closure so you have easy access to your medications. There is an ID label inside the closure flap to write your name and a phone number. There is a keyring loop to attach the carrier to a bag. The elastic loops on the back of the carrier allows you to wear it on a belt or strap either horizontally or vertically. 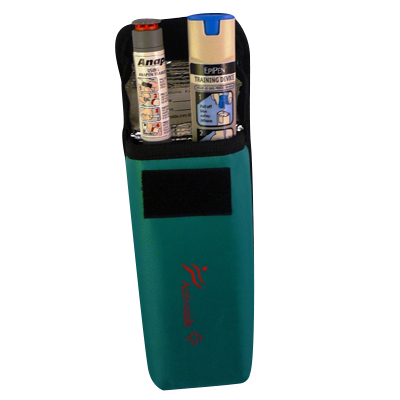 It can be used with our waist belt for adrenaline pen cases, which can be purchased separately. Padded and foil lined for protection. Key ring for attaching to bags. Elasticated loops on the back for attaching to straps and belts. 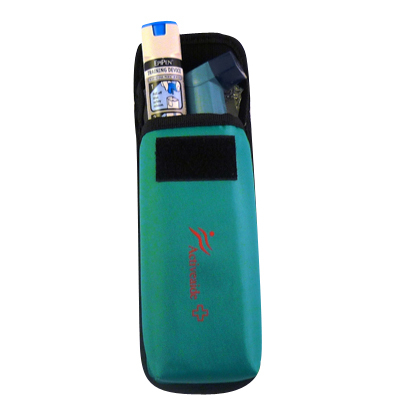 The Emerade® pen will fit in the Twin Sea Blue case but it does not hold the hard case supplied with the pen. Light, easy to carry, can slip onto a belt too. Excellent carrier. Really like the case, it snuggly fits 2 Epi pens in their cases. It fits into my husband back pocket so i don’t have to carry it in my handbag all the time. The one downfall is the loop broke after a short time. I got a sewing shop to add a new one for me and we added a carabiner clip for attaching to bags and belts, which is very handy for school (junior infants). It’s great now. A great product for visibility, keeping the pens at a stable temperature but I would have liked enough space to include a copy of the treatment plan. The internal compartment is just the right size for two AAI’s in their plastic housing, overall pleased. Sturdy and lightweight easy for my 10yr old to wear around her waist at school and still do handstands! Fits two epi pens snugly. This is the second one we have had to buy as the first one wore out but only after much use.